A 73-year-old man couldn’t find his way home in the Forbidden City. After some days, people found him in Tianjin. It’s about 100 km from Beijing. Grandpa Yu was trying to walk back to his home 2,000 km away from Rui'an, east China's Zhejiang, but he made the wrong way and walked to Tianjin. A stranger found him walking in Tianjin and brought him to a police station. Grandpa Yu was with some other old people in the Forbidden City. He couldn’t find his friends after a while. He then asked some people around him for help, but they could not understand his words. Without a phone or phone numbers for his children, Yu decided to walk home. 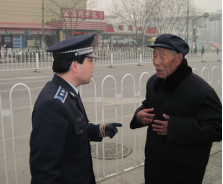 Some people joked that Beijing’s smog made Grandpa Yu get lost. "I will never travel again," Yu told the newspaper. 1. How old is Grandpa Yu? 2. The Forbidden City is ______ away from Rui’an. 3. The old man and his friends travel in _______. 4. How did Grandpa Yu get to Tianjin? A Grandpa Yu doesn’t speak Putonghua. B Grandpa Yu doesn’t have any children. C Grandpa Yu got lost because of the smog. D Grandpa Yu wanted to see his son in Tianjin.